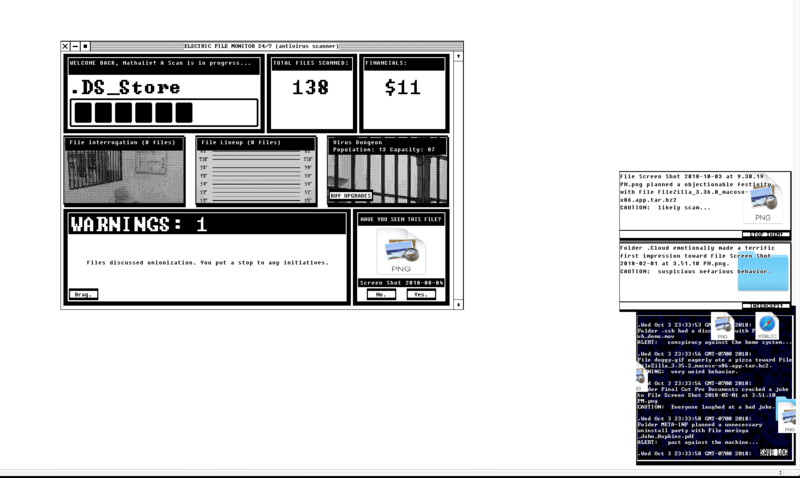 ELECTRIC FILE MONITOR, my virus scanner, was just posted to itch and gamejolt. ELECTRIC FILE MONITOR is pitched to you as a state of the art virus scanner, and free preventative tool against all types of malware... but there's a lot more to it. This is software as political commentary. I mean, they said to keep politics out of games. Nobody ever said anything about software. So this is OK. The program is a joke. It's comedic, and the premise is antivirus software. I suggest maybe trying it before reading about it here. What I set out to do was use a familiar terrain that we all take for granted: files. Then build a story around that. Personalizing something that we are indifferent to can get us to look at it in a different way. What are our files thinking anyway? We're very used to doing whatever we want with the information on our computer. What if something alludes to that having a personality, and gives it agency? So it's an interesting setting to begin with. Computers are supposedly our servants. We own them. They should obey. Software that malfunctions, or behaves outside of expectations, aggravates us. I mean, it's all perfect terrain to explore if you want to comment on power structures. Speaking just from personal convictions... only abusive people truly succeed within a system. To be successful you have to lack humanity. For example, the billionaires of the world don't care about their workers. Abuse is financially rewarded. Even in the language of success (example: "dog eat dog") the ability to be brutal is almost romanticized. So to be successful you take advantage of those around you, or those you are placed in charge of. Success within a system means to master indifference. Overall that's the theme of ELECTRIC FILE MONITOR, framed humorously. All this comes off as a joke, on the surface, but as you interact with it, I suppose it allows room for observing these things. I didn't want it to be very serious, tho it makes for interesting social commentary. You open the program, a happy and somewhat creepy jingle plays, and you're greeted with this scanning system. 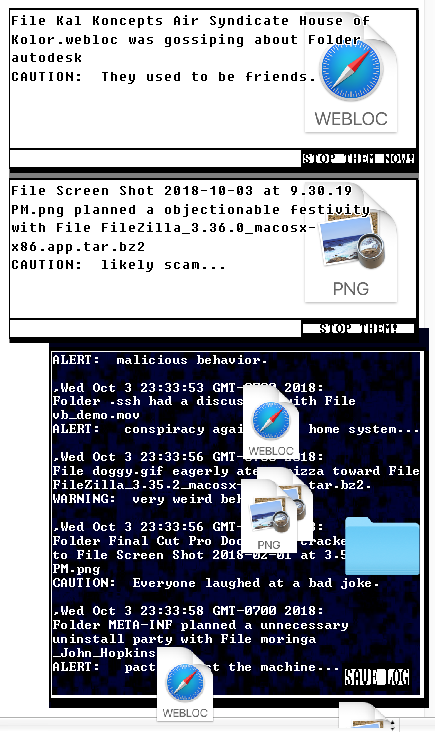 Suspicious activity such as making bad jokes, not greeting another file (even though they used to be friends), or files planning dinner parties, are all reported by the scanner. You choose what you think is suspicious. Once you do that, you're given a prompt with options of what to do with them. Send them to File Interrogation, File Lineup, or Straight to the Dungeon... being the most notable ones. It's pretty self explanatory from there. 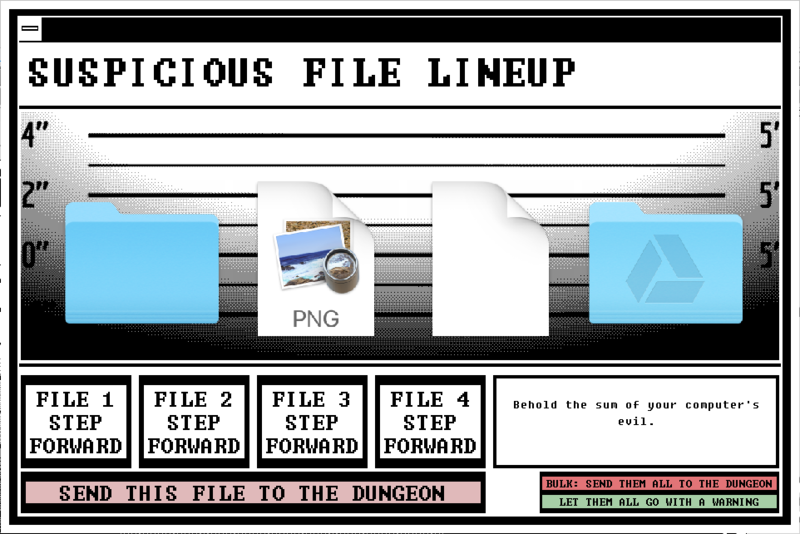 File Interrogation lets you interrogate your files. There's quite a bit of writing that went into it so that it's not repetitive. File interrogation is a good place to get to know your files. 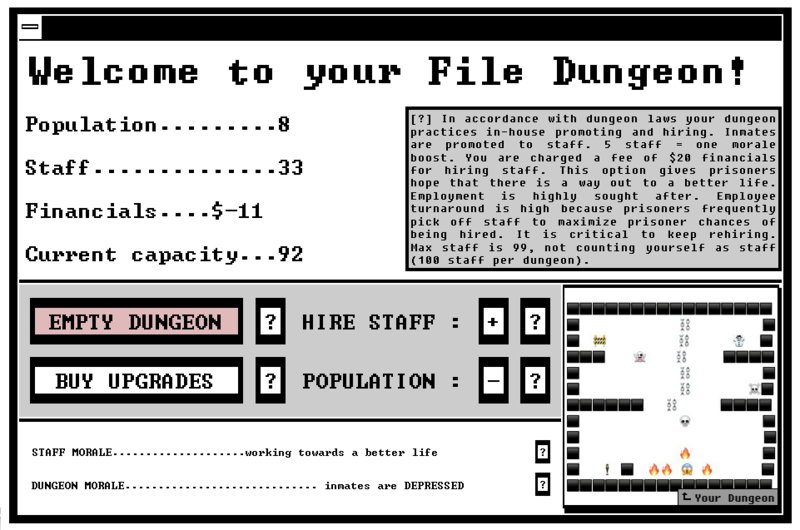 The point is to send as many files to your dungeon as you can. If you report files, you get more money. If you spend more time interrogating files you get more money. 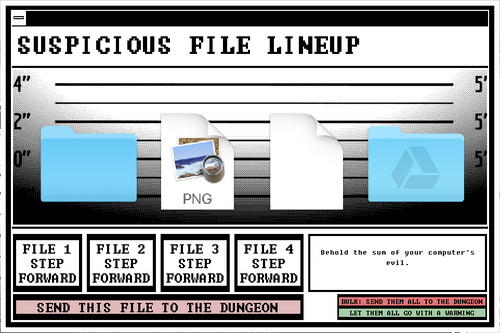 And if you have a full lineup of files in the File Lineup you get more money for that one file that you single out and decide to send to the dungeon. The higher your dungeon population, the higher the reward when you "Empty" your dungeon. The scanner has all that explained in the UI, and I think it's most interesting to get to know all the rules from there. ...The longer you spend with your files, like interrogating them, the higher the financial reward. On the other hand, the longer you spend with them the more you get to know them, the worst you might feel about what you have to do in order to succeed. So does succeeding within a system encourage indifference toward others? Is indifference the only way? Everything about this scanner is built to maximize your financial reward. The more brutal you are, the higher the reward will be. The scanner punishes you for not participating and profiling files. If you let too many files go, financials get deducted... and if you're in the negative you cannot quit the program. So you become a prisoner, trapped in the performance of succeeding within the system. What I like about this is that it starts to feel like work. As you get into it, and the more you focus on maximizing your financials, the less you care about your files. The less you read what they are saying, the less you pay attention to the personality (back to being just a computer user), and the more you fixate on maximizing reward. Futile, depressed, asking questions, angry, and then organizing. Organizing is what happens right before a riot. Once a riot happens you start losing a lot of money, and staff gets picked off. You have to empty your dungeon to stop the riot. To earn as much money as you can, you want a high prison population, but you have to carefully monitor morale. 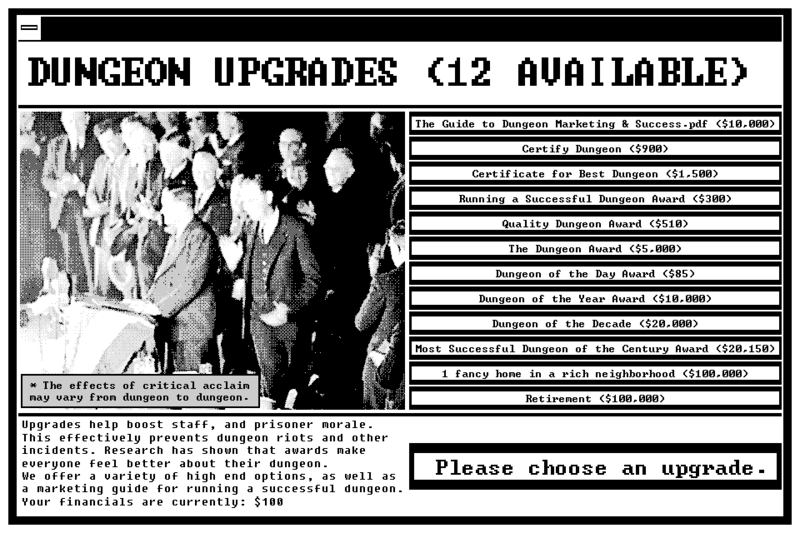 There are Dungeon Upgrades to keep prisoner morale from deteriorating too fast. You buy "critical acclaim" for your dungeon. There are a few award, and certificate options. Everyone loves an award wining dungeon. Prisoners feel good about their dungeon if it won awards. Awards actually save out to your drive so you have that souvenir. There's also a .pdf that is a marketing guide to financial success that you can save... but ok. You can see that for yourself. ...The more expensive the award, the longer it will take for prisoner morale to deteriorate. If you get them all you can have a higher population between riots. ...So, overall, that's a lot. You can get the picture as you interact with it. There's plenty of writing in the UI, and file dialogue, so it's not hard to figure out. I think the ending is what's most interesting about this. You have two final options. To buy a fancy home in a rich neighborhood to retire to, or retirement. If you retire, you get an overview of your financials after taxes, and debts owed, and basically have nothing. If you had that house, you can't make rent. So essentially there is no winning. Success exists only as long as you are performing. That's it. I made a political commentary thing because I need at least one of those. It asks relevant questions about labor rights, power structures, and power dynamics, and the delivery is interesting.